The following is a list of guild programs that were offered during the 2016-2017 guild year. Please bring the items you gathered, the techniques you learned, the experiences shared through volunteering, the items you made for self or sale. If you have a favorite photo or two of the events forward to Kathy Wulff (wulffkathy@gmail.com) to be included in the program slide show. Turning thrums, scraps, workshop sample projects, and not-so-greats, into useable items and other small gifts. 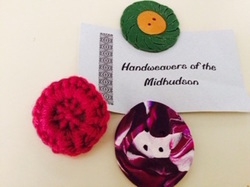 We will Challenge Guild Members to create small items that will be inserted into MAFA Goody Bags for the 2017 Conference. Also the Weaver's Challenge items will be revealed! 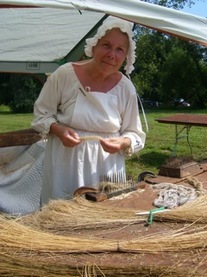 Pam Rumney presents "Linen is My Thing"
Pam will share her experiences growing, spinning weaving, and sewing linen. She has been an historic re-enactor at the Londowntowne Historic Site near Annapolis, MD. The accompanying photo is of her in her linen garb. Pam recently moved to South Carolina, near Charlotte. 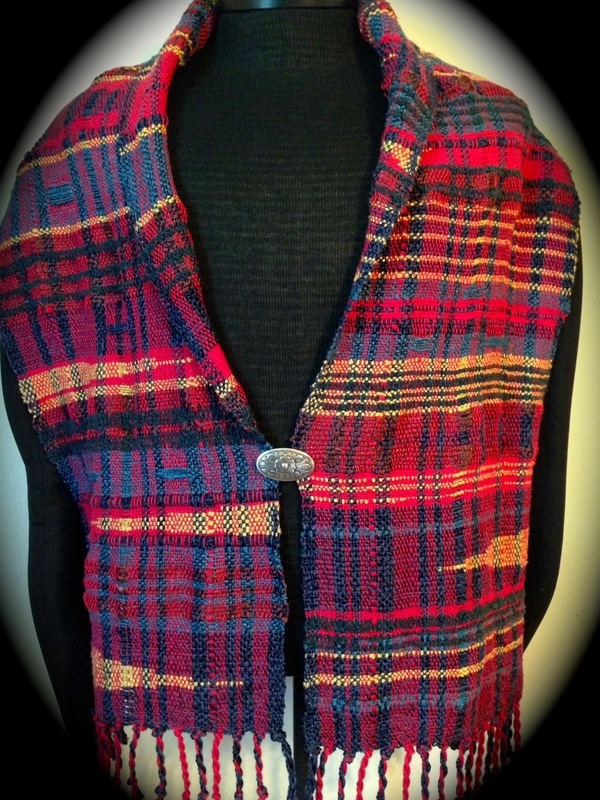 She has been a member of Weavers Guild of Greater Baltimore and Annapolis Fiber Artists Guild. She now is exploring fiber opportunities in the historically fiber rich communities of Western NC. Enjoy a potluck supper and participate as seller and/or shopper in our annual Weaver to Weaver Sale, while visiting with fellow weavers in a casual setting where we will draw cards for our Weaver's Challenge for 2017 (finished product to be presented at the September 2017 meeting). We will also have our traditional Gift Exchange (optional, fiber related, $10 maximum value recommended). This is the most relaxed and casual meeting of the year - truly a social event. Participate in all of the activities or just come to eat and talk and enjoy your the company of your fellow weavers. Hats, scarves and mittens for children and adults at the Women's Shelter. Items for children should be made with machine-washable yarns and bright colors. Bring yourselves and get ready to have fun! Make and Take - the 2nd time around. Making Cloth Aprons for Your Loom. Pattie Lamb will bring a Wolf Pup and show you how she attached aprons to the loom. 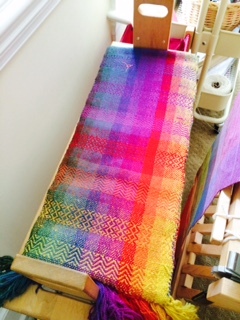 She will also explain how having aprons might improve your weaving and how they might change your warping methods. She will supply instructions for you to take home. 5 Knots That Weavers Need to Know. Marion Flint will demonstrate the ins and outs of 5 needed knots. A handout will be available. Saori weaving is a contemporary free-style weaving movement. Developed in Japan by Misao Jo in 1968, it is enjoyed today in over 40 countries by persons of all physical abilities and intellectual aptitudes. While free style creativity is nothing new in fiber art, Saori weaving focuses on spontaneity, self discovery, and inventive process: no mistakes, no rules & no restrictions! 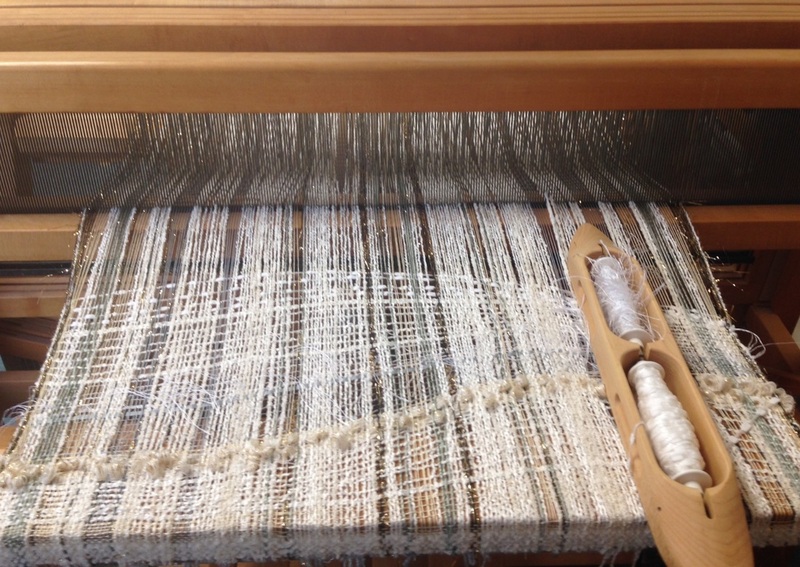 Saori song weaving studio was the 11th certified studio to be established within the United States. Just back from Japan, Dawn will share Saori history, principals, practicalities, techniques, photos and finished garments & banners. 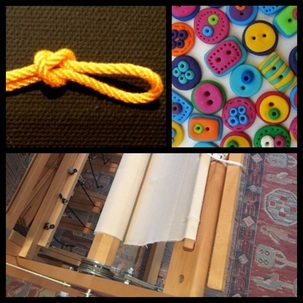 Try your hand on several portable streamlined Japanese looms (engineered with built-in bobbin winders and pre-warped rolls). 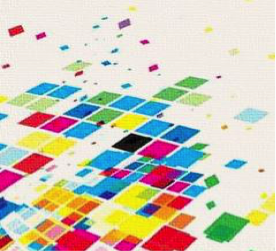 Peruse innovative devices, adaptive tools and Japanese pattern books. Celebrate “beauty with lack of intentions”. 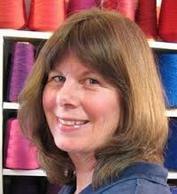 Sara will give a talk focusing on a retrospective of her forty years of weaving and teaching. 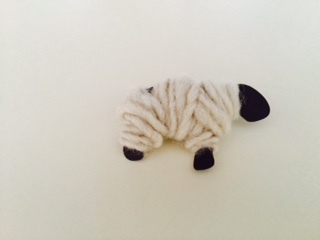 Sara Lamb lectures and gives workshops in the US, Canada, Australia and England. She maintains a working studio in Northern California, where she lives with her husband, looms, spinning wheels, dyepots and beads. She will be teaching our Spring Workshop called Spin to Weave Friday and Saturday, March 24 & 25, 2017. Presenter: Janice Knausenberger -International traveler and weaver. Janice creates unique woven art pieces using a variety of processes including a self-taught variation of the Theo Moorman Inlay technique. Visit her website www.jgkdesigns.com for a peek. The May 25, 2017 Triangle Weavers guild meeting will be a progressive walk-around held at the Triangle Fiber Arts Center (TFAC). The later sunsets in May mean we can hold our May guild meeting at our space and still see the street signs on the way home! As our guild membership grows it is a little harder for us to know each other and to know each member’s interests and talents. 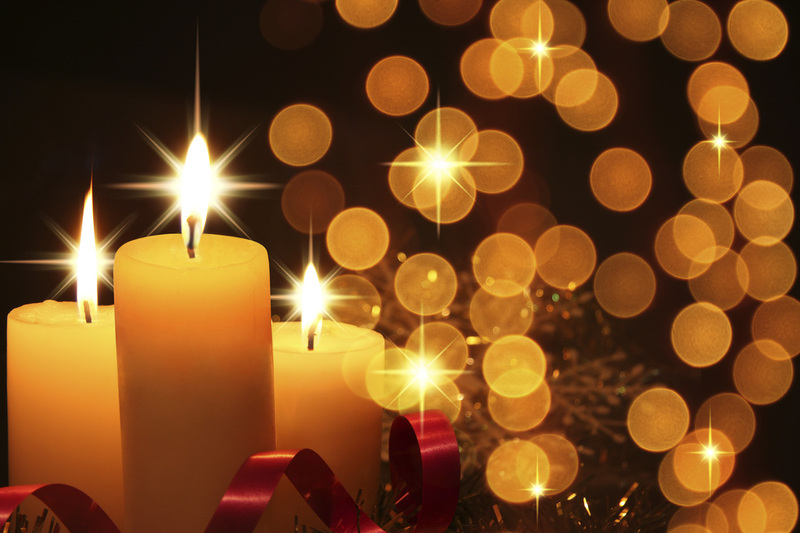 By gathering at TFAC we can talk the night away and get to know each other better. We are meeting at the Triangle Fiber Arts Center to show all of you who have never been there what a great place we have and for everyone to celebrate the 45th Anniversary of TW. We want everyone to feel at home here. Various stations will be set up in our classrooms and the hallway for you to ask every burning question you have about the Triangle Weavers guild. Come learn things you never knew about the guild. Triangle Weavers started 45 years ago this spring. And we’ve come a long way. We will not have a business meeting, but instead spend some time learning about the guild’s structure and activities at the information stations. Then the guild and Board members are providing a buffet dinner and there will be cake! Come celebrate the Triangle Weavers Guild. We will have a free raffle for those who attend and time to share summer plans before the guild takes a summer break from monthly guild meetings. TFAC drop-ins, classes and workshops will continue throughout the summer. Note: Our traditional Beast in the Bag Challenge will not be done at this meeting but will be postponed until sometime early in the summer or fall of 2017. Details will follow.